David Stratkauskas is a native of Vancouver, where he completed his MA in Music Theory at the University of British Columbia. In Vancouver he was organist and choir director at St Paul’s Church, and freelanced as an organist, pianist, and conductor. In 2003, inspired by his particular love for organ and choral music, David moved to London, where he became organist at St Michael’s Battersea, overseeing a typical English choral programme from which several of his choristers went on to scholarships at Cambridge colleges. Following this, from 2007, he was Director of Music at the parish church of St Mary Stoke Newington. David also accompanied choirs such as the Syred Consort and the Harsnett Choir, playing the organs of Derby, St Alban’s, Norwich, and Canterbury Cathedrals. In addition to church choirs, David directed several children’s choirs and the choir of News International, publisher of the Times, and continued working as a freelance jazz and lounge pianist in the West End of London, as well as teaching theory and musicianship classes. 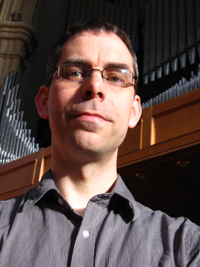 David moved back to Canada in 2010 to take the position of Organist at St John the Divine, Victoria. He is married Soile Stratkauskas.